Interesting post floating about the last few days, from the blog understatement.com, giving a different spin on the fragmentation issue that has plagued Android phones since the beginning. 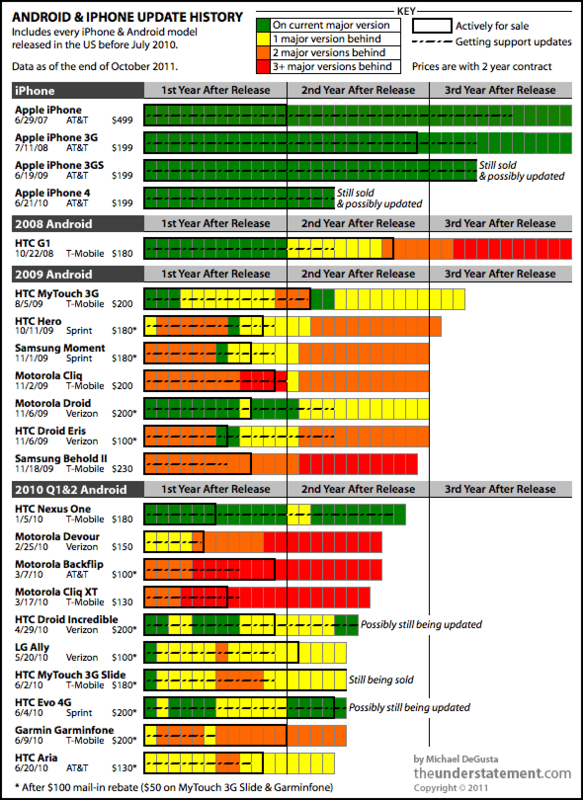 While iPhones get the OS up to date periodically, Android phones are essentially at the mercy of the carriers and the device manufacturers. The post outlines the impact of this fragmentation on users, developers and the security of the phone itself. The biggest impact though, I think, is in actual sales. Selling an outdated phone means you have fewer people who want to now commit to a two-year lock-in. People are still buying the iPhone 3, because they know that it is a phone that is actively being supported by Apple. And yet, for me, there is another aspect of this that is not obvious from this picture. The world of modified software. CyanogenMod calls itself an aftermarket firmware for Android phones. Essentially it is a modification of the Android OS, which, unlike the iOS, is Open Source. It provides additional features, not available to stock Android devices. But more importantly, the capability is not forced like with a jail-broken iPhone, but using pieces of the original Android OS itself. Yes, the fragmentation of the Android market means I am going to delay my purchase till I am sure I am getting a version that is going to last me for at least two years. But it is also the price I am willing to pay - for a device that is actually mine. A number of people have sworn by Google Calendars as a great way to keep oneself organized. I had two problems in getting onto the bandwagon - I did not have that Android phone yet. And keeping Google calendar synchronized with my work calendar seemed such a chore. Turns out the second one isn't such a big issue. Gmail gracefully handles meeting requests from MS Outlook and my Exchange servers. Yes, there is no way of choosing which Calendar the meeting goes to, but hey at least it is now possible to have my work and life overlap again. Now for that Android phone. BodyShopBids.com is an interesting website, with a lot of potential. If you are ever in an auto kerfuffle, and need some body work done, this seems like a great way to get some bids to fix the damage without a lot of driving around. I recently got into one such scrape myself, and when a friend suggested this site. I was naturally overjoyed. So, I created an account, took photos of the damage and created a report. As it turns out the site is predominantly focused on the Chicago area, and did not have too many body shops signed up near me. While the guy from the company who called me up was definitely super-nice about it, the whole experience got me thinking of the travails of start-ups that connect physical world with that part of the world online. There are some problems shipping can solve, but for something like this, the only answer is a Groupon-scale company. And without the scale, it is life between a rock and a hard place. Do you advertise your limitations on the site, and have potential customer's lose interest? Or spend a lot of time on the flip side, telling users that the service is not available in their area? While you figure that out, I'll be hoping BSB comes soon to a body shop nearby.